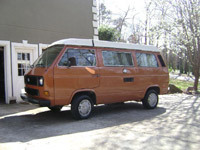 The 1983 Volkswagen Watercooled Westfalia Vanagon Camper Model History. 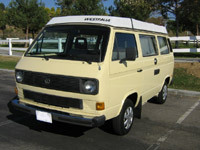 In 1983 the new version of the Volkswagen Westfalia Vanagon Camper was released. 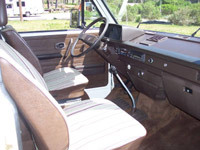 The main difference between this and the earlier versions was that it was now powered by a water cooled engine. 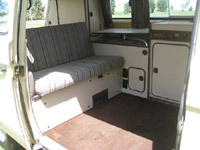 The information below is relating to the 1983 Watercooled Vanagon Camper for the USA / Canadian market with the beige furniture and the brown/green or brown/blue upholstery. 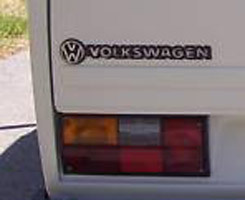 To read about the earlier air-cooled and diesel (water cooled) Volkswagen T25 / T3 Westfalia Vanagons manufactured and registered between 1980 and 1983 CLICK HERE. 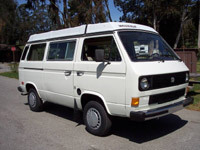 The VW Westfalia Vanagon campers were designed for the market in the USA and Canada and were available only in Poptop (elevating roof) form. 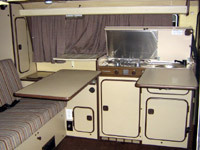 Whereas the models built for Europe were available in both poptop and hightop versions. 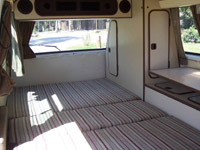 No prices yet so if you have any information or price lists for the Watercooled USA Volkswagen Westfalia Vanagon camper please send them to me. 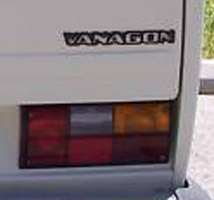 It would appear that once the 1983 Watercooled petrol engine version was released production of the diesel Vanagon Camper was stopped. 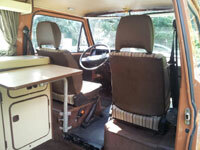 The 1983 watercooled Westfalia Vanagon Camper was available in one layout. 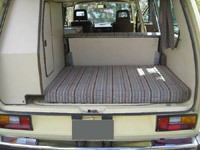 This was the same layout as had been used in the aircooled Vanagon P27 (Pop Top). 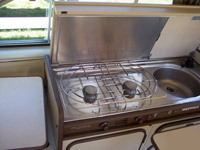 1) Combination cupboard 87 cm wide x 45 cm deep on the left behind the drivers seat with sink, two flame LP gas cooker with splash plate. 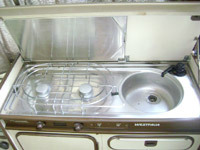 The splash plate folds down and can be used to drain dishes after washing. 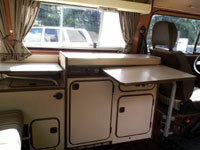 Also the unit has a cutlery draw, a large cupboard for tableware and a fridge. 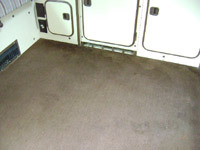 2) Cupboard unit with 10.5 US Gallon (40 litre) integrated freshwater tank. 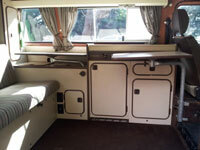 3) Wardrobe (with mirror on inside of door) and storage unit with 3 shelves over the engine bay. 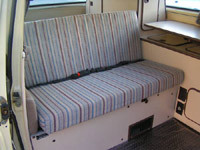 The 1983 Watercooled Westfalia Vanagon Camper had beige furniture and upholstery with either brown and blue or brown and green stripes (as had later versions of the aircooled Westfalia Vanagon Camper). 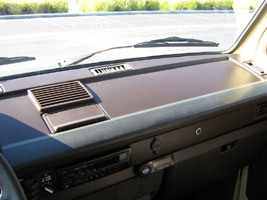 The 1983 Watercooled Westfalia Vanagon Camper had beige furniture and the upholstery was either “van Dyck KD” (brown and blue stripes) or “van Dyck KW” (brown and green stripes). 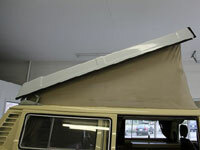 Fibreglass roof had an opening plastic window (29 cm x 39 cm) with mosquito net. 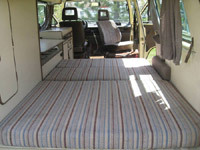 The double bed in roof on pop tops was light brown for all pre 1986 Westfalia Vanagon Campers. 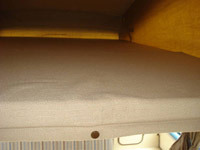 The roof canvas on pop tops was light brown for all pre 1986 Westfalia Vanagon Campers. 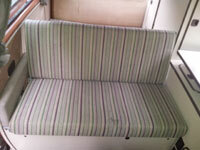 Insulated on all inner bodywork in the living area with 25 mm thick mineral fibre plates. 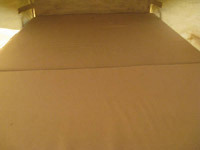 Floor area has a plywood sheet with PVC covering. 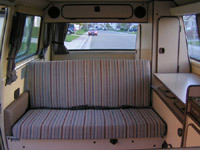 The 1983 VW Vanagon Westfalia Camper had opening sliding windows on the sliding door and above the kitchen unit. 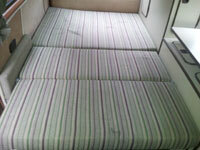 Curtains all round including drivers cabin area. 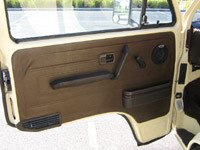 The curtains for the sliding door and front windscreen were clipped on when required. 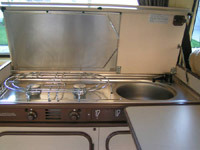 45 litre (1.5 cu. 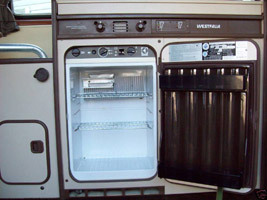 ft.) fridge working from 12v, 110v AC or LP gas. 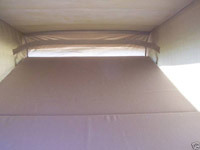 40 Litre (10.5 US gallon) freshwater tank with electric pump and external hook up. 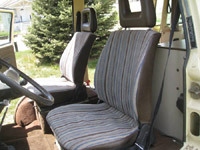 Swivelling passenger and drivers seat (driver 90 degrees to right, passenger 180 degrees to rear) with frame type headrests. Diode control display system on the kitchen unit showing fresh water tank level, battery charge level and indicator when fridge is running on gas. 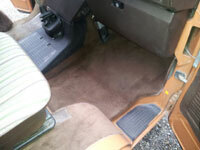 Speedometer with resettable mileage trip. 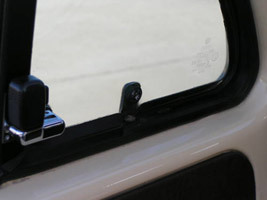 Vanity mirror in front passenger sun visor. 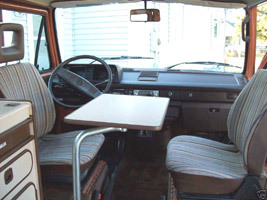 Safety steering wheel with energy absorbing and collapsible column. 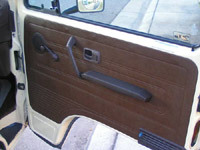 Two speed front windshield wipers with intermittent cycle feature. 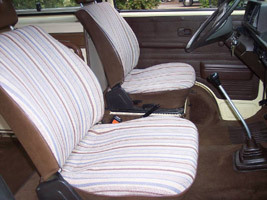 Three point seat belts in front and 2 x rear lap belts. 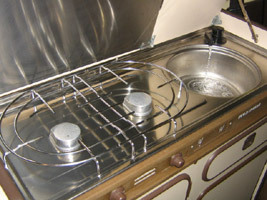 Illuminated ashtray with cigarette lighter. Flow through fresh air ventilation with 3-speed blower-assist. 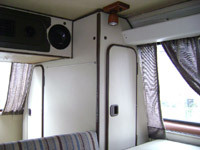 Multidirectional heated and fresh air distribution system with illuminated control panel. 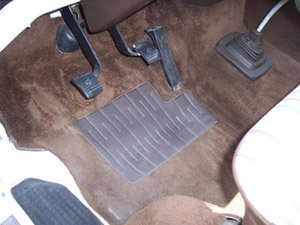 Separate rear heater with 3-speed blower- assist. 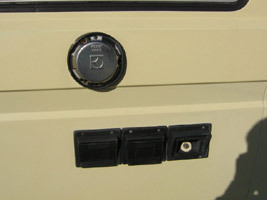 Storage compartment on drivers door. 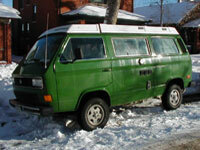 Steel wheels with full wheel covers. 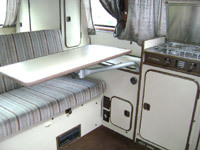 AM/FM Cassette Radio and Four Speakers. 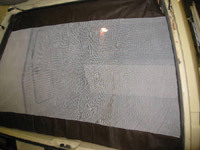 Radio Preparation consisting of Four Speakers, Antenna and Suppression.